Bank robberies are unfortunately a common enough occurrence to keep everyone on their toes. There were 4,091 bank robberies reported to the FBI in 2015, which amounts to approximately 11 bank robberies a day. This staggering number is enough to make sure everyone is observant and knows how to respond in the face of an emergency. Panic buttons for banks may be able to help bank employees and customers feel the peace of mind when transacting business. Why Use Computer Panic Buttons for Banks? Little known fact: many traditional panic buttons for banks do not actually connect directly to the police. Most silent alarms contact either an internal security group or a third-party security company. The security personnel may either pull security footage or call the bank to assess the situation before contacting authorities. This delay could cause valuable time to be lost when trying to track down a robber. In the event of an emergency situation, every second matters. Computer panic buttons for banks would be especially helpful for several reasons. First, CRS Notify panic buttons connect directly to 911 with the E911 platform integration. This cuts out the middleman and authorities are notified instantly of a high alert being raised. Ultimately, this would be helpful in trying to catch a robber as they leave the bank. Secondly, our two-button wireless hardware devices have a range of 750 feet from the USB receiver. 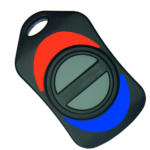 The wireless button is especially useful to the ATM custodian to wear on their person while adding money to the ATM. If the ATM custodian feels threatened for whatever reason, they can discreetly raise a low alert to notify their colleagues to keep a lookout. If there is an imminent threat, the custodian could quickly and discreetly raise a high alert to contact the police. One of our unique features allows several computers within a building and campuses alike to be networked together. 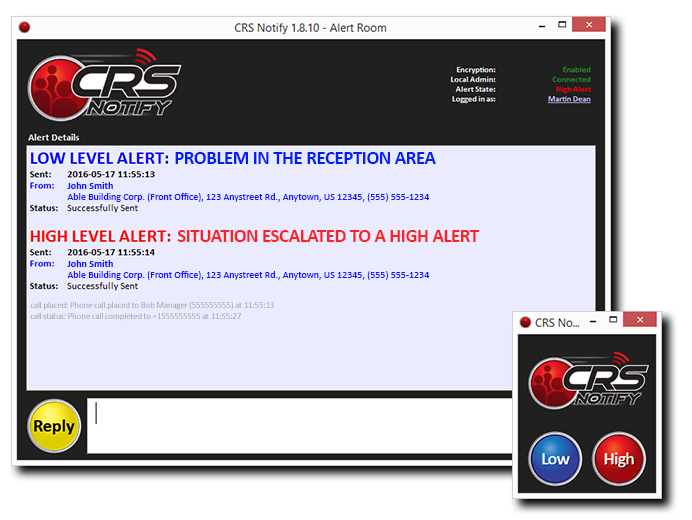 With CRS computer linked panic buttons, all people in the network will be notified if an alert has been raised. For example, if a high alert was raised from a teller behind the teller line, their branch manager that is with a customer off-site could receive a text message about the situation just moments after the alert. First and foremost, the biggest thing that bank employees can do to deter robberies is to be aware of their surroundings. Even though the gesture may seem small, bank employees should greet and make eye contact with each and every customer that comes in the door. Bank robbers usually want to maintain anonymity. There have been many cases where just a simple greeting has deterred a robbery. Employees should also be trained in spotting suspicious activity. This activity can consist of customers spending a long time in the bank. Another instance would be cars that cruise by multiple times a day, casing the joint if you will. Any suspicious activity should be reported to a supervisor as soon as possible. Surveillance cameras are also a deterrent of bank robberies. Again, most bank robbers want to maintain anonymity. There have been many reported cases of a surveillance camera preventing a robber from robbing a bank. Bank tellers should keep in close adherence to company policy when it comes to the amount of cash in their drawers. Amounts should be kept as low as possible to be able to conduct business. Any excess cash should be locked in the vault. Vault timers should be used whenever possible. Many banks will lock their vaults up for the night and set the timers to go off the next morning. Meaning, if the end of the day is at 5 pm, the timer is set for 16 hours later if the following work day starts at 8 am. In other words, the vault physically cannot be opened during the interim. Every bank should have an incident response plan in place that all employees are trained to follow. In addition to panic buttons for banks, incident response plans are extremely important to have in place. Of the 4,091 bank robberies reported to the FBI in 2015, 2,416 of them involved the robber passing a demand note to the teller. Demand notes are an enormous source of evidence and should be preserved if it is safe to do so. Notes should not be handled or touched any more than is necessary. The demands of a robber should always be followed. Many robbers do not want to draw attention to themselves. For the safety of employees and customers, the best course of action is to follow the demands of the robber. Panic buttons for banks are helpful when trying to catch a perpetrator after the fact. However, panic buttons should only be activated when it is safe to do so. In fact, many bank security and law enforcement personnel will advise that panic buttons in banks not be used until the robber has left the premises. A hostage situation could potentially be triggered if the robber happens to turn around and see police waiting on the other side of the door. Because robbers tend to want to leave as quickly as possible, the best course of action is to allow the robber to leave. This action will lessen potential victimization of those in the bank. Those who were directly involved with the assailant and other witnesses should be isolated from each other as quickly as possible to fill out statements. Many law enforcement officials advise the separation so that everyone has an individual account of what happened. This way the recollection of the situation is not tainted with the accounts of others. In closing, computer panic buttons for banks would be beneficial in a robbery situation. An alert could be activated within moments of a robbery happening. Police would then be dispatched moments later. Computer panic buttons for banks also cut out the middleman when contacting emergency personnel. Instant notification prevents excessive time between alarm and dispatch. Bank employees can rest easy knowing that in the event of having to use a panic button, the authorities will be there within moments. Still Unsure About Panic Buttons for Banks? Contact us for more information to make the best decision for your panic buttons for banks.